I guess I like vampires. I never really thought about it too much but I did read and love most of the Sookie Stackhouse novels. Sure, they got pretty bad toward the end but I had to see the series through. The show, True Blood, based off of the books was one I watched every week. And I’m not much of a television kind of a gal so this was a big deal. One day out of nowhere I saw a random comment that said: “everyone should watch Byzantium on Netflix instant”. I quick look at the cover, because I’m totally guilty of judging books (and movies) by their cover, and I decided that it looked like a good one. I started watching the show, not having any clue that it as about vampires. Seeing Gemma Arterton I automatically assumed that it was a period piece. I sat there and stared at the screen for the first 20 minutes or so before I realized that this was a horror film about vampires. If you’ve seen the movie you know that one of the characters feeds pretty early in it so you’re probably scratching your head with “how did this chick not know what was going on?” I quickly paused the movie because I was trying to relax before bed and I knew a scary flick was not the ticket. In the end, I watched it during the day while packing up boxes to move away from Oklahoma and it was really good. And I remembered that I really liked Interview with a Vampire too. So, yeah, I guess I like vampires even though I didn’t really notice it. 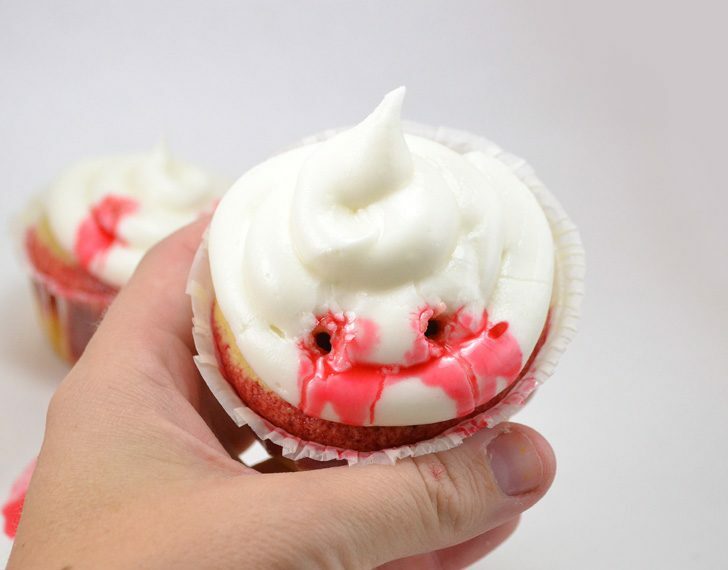 Here are cupcakes like you’ll need. Mine are actually from a gluten-free boxed mix because it is so much faster than mixing up a bazillion flours like you often need in GF baking. Feel free to use a box mix or your favorite homemade recipe. 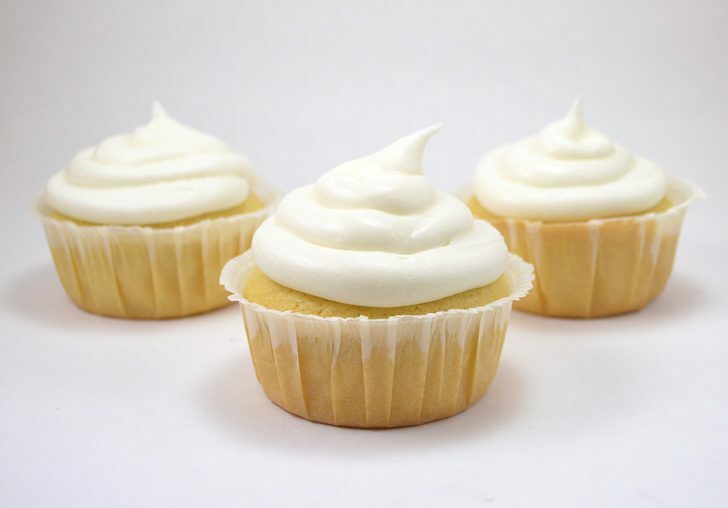 You’ll want the cake mix to be white or light yellow and you’ll need to bake them in white cupcake liners. 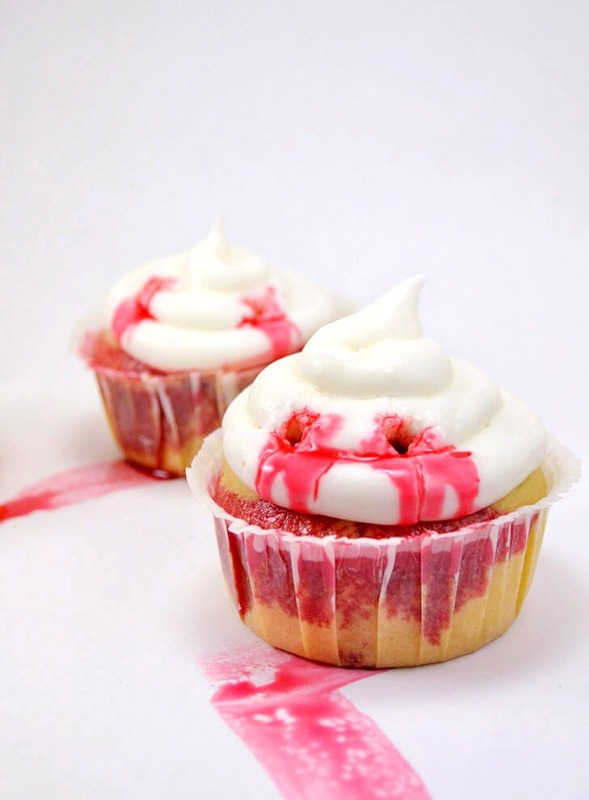 These are actually ones that stand up on their own meaning you don’t need a cupcake pan to make them work. They’re really pretty nifty. 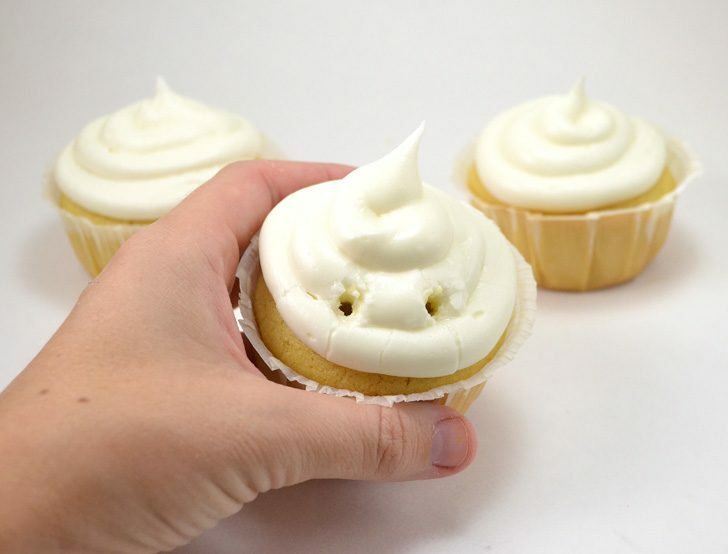 Mix up or buy some white frosting and get that business up on top after your cupcakes have cooled. Let them sit a while so that the frosting begins to harden a bit. 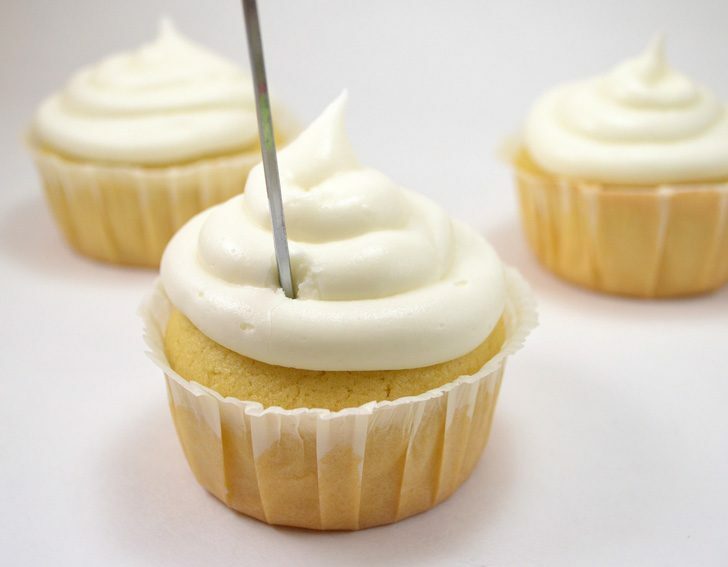 Using something sharp and pointy like a toothpick or a skewer, stab your cupcake through the icing into the cake. Move the stick around in a small circle to rout out your first vampire fang mark. Repeat an inch or so away through the frosting and into the cake. You’ll want to see very obvious puncture marks before continuing. Now we almost have a complete vampire bite! 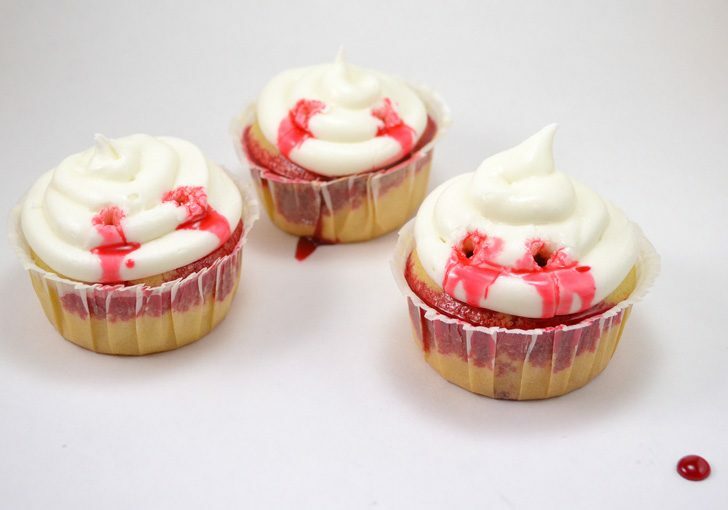 You can buy candy blood in stores around Halloween. This is actually one of two vials that came in a package from Walmart for around $3. 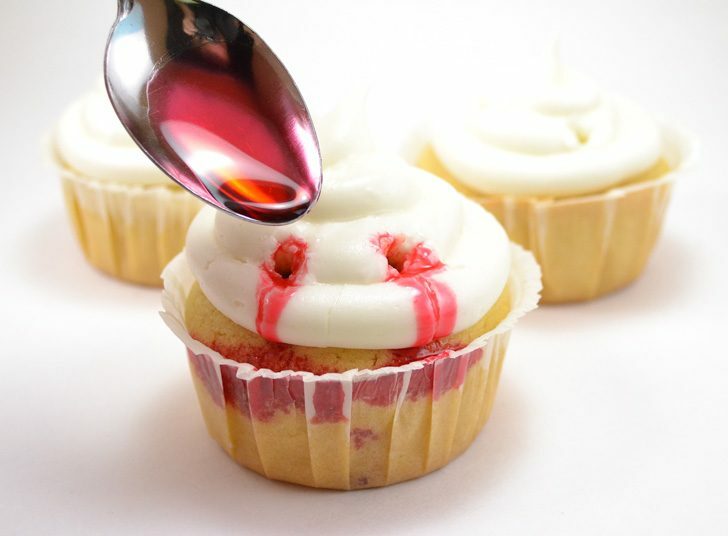 Using a spoon (or pouring straight from your vial or bottle if possible) run the candy blood into the holes of the cupcake. You want for the blood to go into the holes and also drop along down as if the punctures were bleeding. 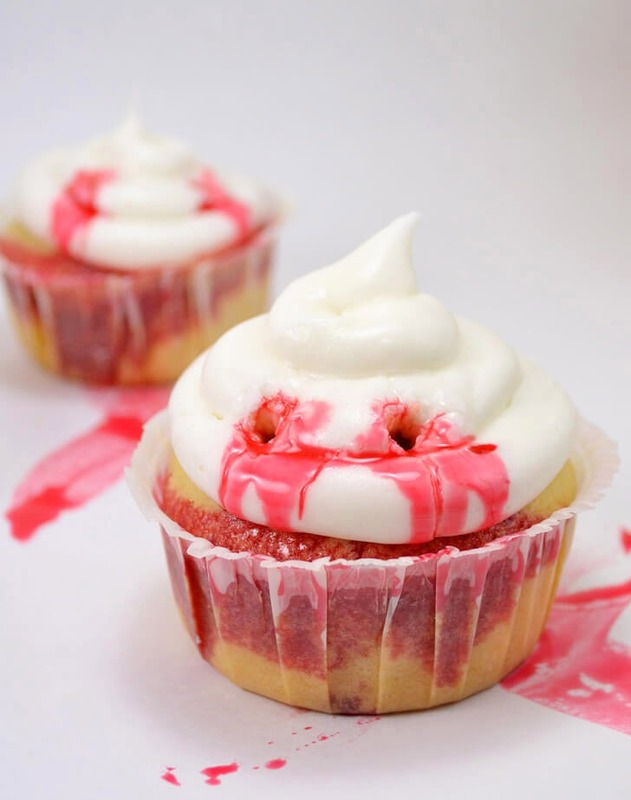 The excess blood will land in the white cupcake for an awesome effect you can see through the white cupcake liner. Now isn’t that creepy? The good news is that the candied blood that I got tastes like cherry candy. 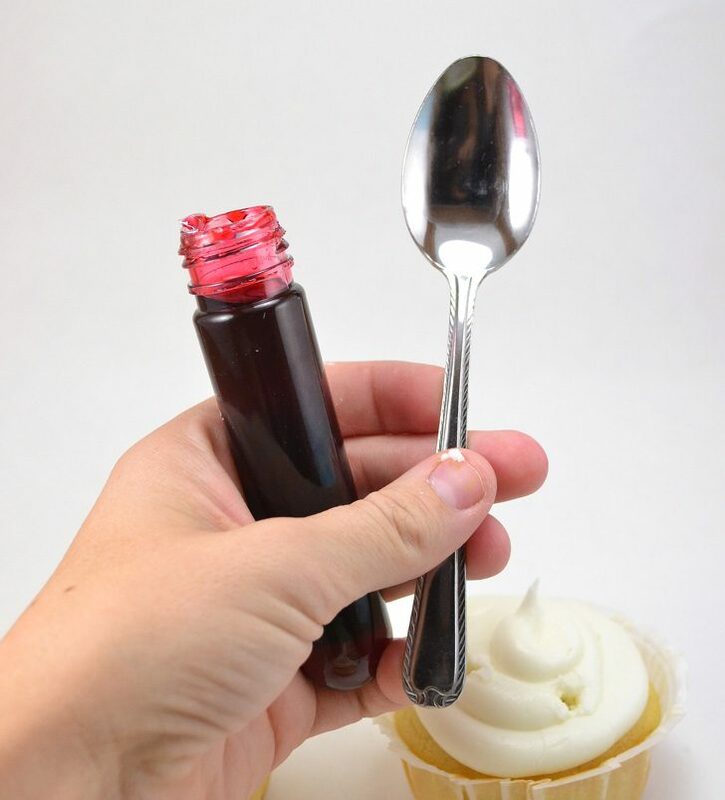 It smells like cough syrup but as long as only a bit is used the effect is actually quite tasty with the white cupcake and simple frosting. And I know they taste good because my parents and I took them all on in 24 hours. Boom. Tasty. 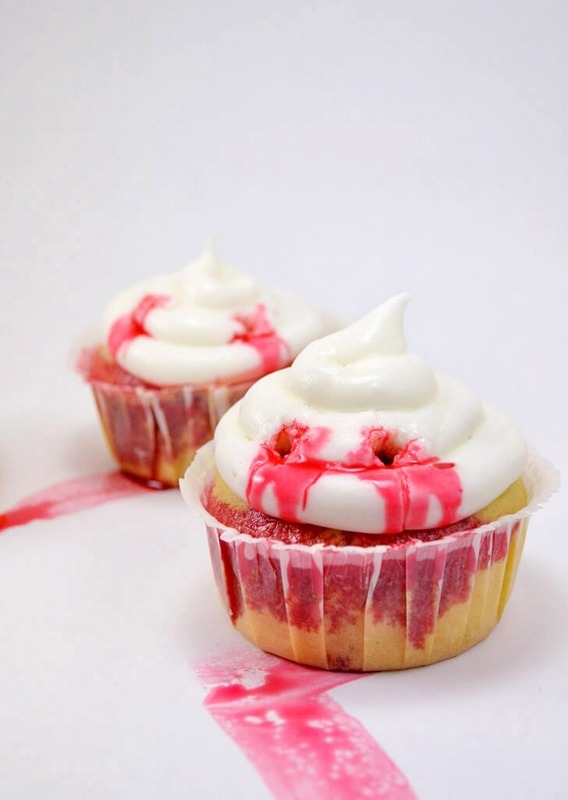 And though I don’t have photographic proof to show you, as these suckers were so quickly devoured, when biting into the bite marks you have two straight down bloody marks that run through the cake that are so stinkin’ cool looking! Using a boxed mix these guys took no time at all. Like lickety-split kind of fast only adding 5, maybe 10, minutes tops to preparation. 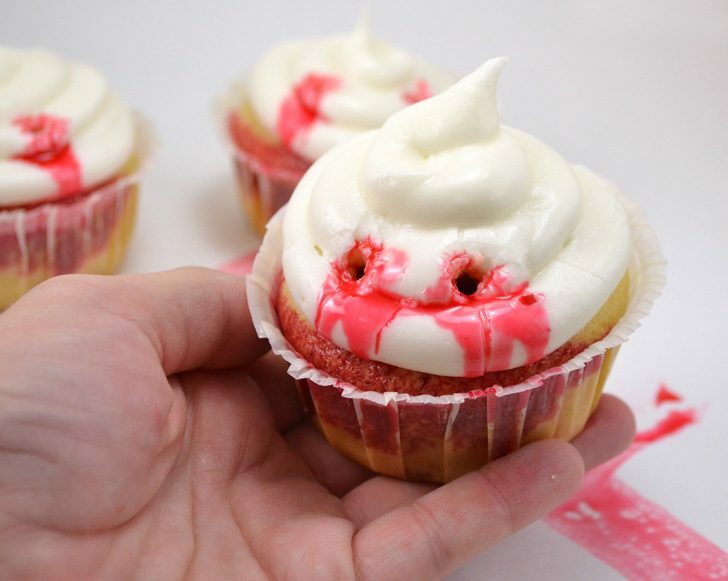 So get your creepy on this Halloween without too much extra effort. 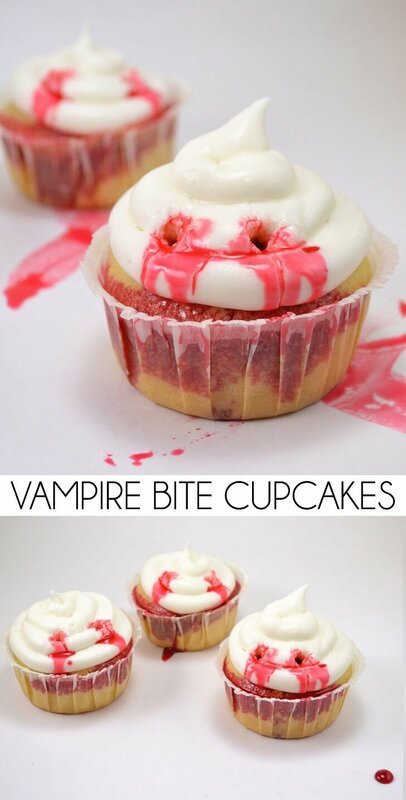 I’m sure the vampire lovers in your life (including me) will thank you for it!